As illustrated in the adjoining diagram, it comes down to how one looks at things. Can we evaluate the situation by comparing two different "snapshots," one of biofuel use and the other of petroleum fuel use? Or is it better to track all movements of carbon (whether in biomass or a fossil resource) through time, as one form of carbon replaces the other? Methodologically, the question is whether to use a fundamentally static method of analysis such as lifecycle assessment (LCA) or whether to use a dynamic method. 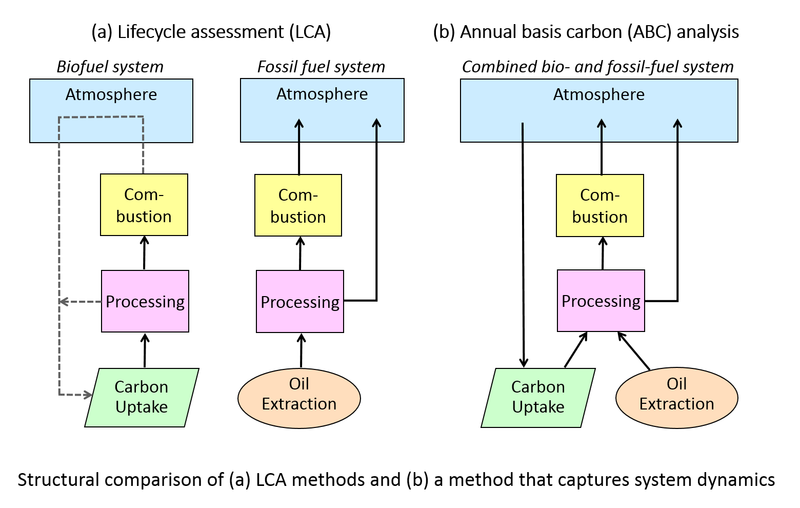 The LCA approach is shown in panel (a) of the figure; panel (b) shows an approach, annual basis carbon (ABC) accounting, that tracks the dynamics. There's nothing special about ABC accounting; all it does is explicitly tally carbon flows exactly where and when they occur. That's instead of introducing assumptions that certain flows do not need to be counted, which is what LCA methods do when treating biofuels as inherently carbon neutral. This LCA convention is shown in panel (a) of the diagram by the dashed line depicting that the biofuel carbon is "recycled." When I first began examining the issue over twenty years ago, the LCA approach of comparing two distinct fuel lifecycles -- a fossil fuel's one-way flow of old carbon from underground and into the atmosphere versus a biofuel's seemingly circular flow of young carbon harvested from the land -- seemed to make sense. But just over ten years ago when land-use concerns were raised, it occurred to me that something was deeply amiss. Accounting for land-use change meant that it was no longer enough to examine a fuel's supply chain and add up the emissions from well-to-wheels, or farm-to-wheels in the case of biofuels. Analysts now had to model ripple effects across the globe and decades into the future. At that point, I realized that the question of how biofuels such as ethanol and biodiesel compared to their petroleum-based counterparts on a lifecycle basis could not be answered through strict use of scientific methods. That is to say, it could not be settled by data, if for no other reason than that we can't get data for the future. After some further analysis (mostly using pencil and paper and a lot of head-scratching), I determined that LCA is the wrong way to look at the issue. My new paper breaks down the key reasons why LCA fails for the biofuels and carbon problem. In addition to elaborating on the diagram shown here, it walks through a numerical example based on real-world data for a corn ethanol production facility. That case study shows the very different results obtained when tracking how the carbon flows actually change from one year to the next (i.e., by examining the system dynamics) versus when using LCA methods that treat the biofuel as a static (unvarying flow) system separate from that of a petroleum fuel. Looking at the dynamics -- i.e., the year-to-year changes in carbon flowing in and out of the atmosphere -- refutes the assumption that biofuels are inherently carbon neutral. Therefore, it's not enough to estimate the emissions only throughout the fuel supply chain. Neither is it enough to project consequential dynamic effects, such as land-use change and various product and co-product substitutions, as long as the static assumption of biomass carbon neutrality remains at the heart of the modeling. 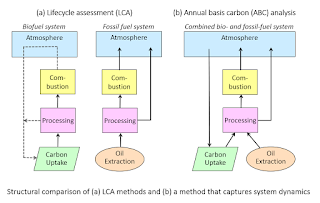 All such LCA modeling fails to explicitly evaluate the extent to which terrestrial carbon uptake during biomass growth actually balances the CO2 emitted when biofuels are burned. After highlighting this critical issue of carbon uptake, the paper's discussion offers some historical context. It turns out that a few researchers noted the need for dynamic analysis over twenty years ago. Nevertheless, for reasons that it may take further historical sleuthing to reveal, the biofuels research and policy communities embraced the fundamentally static assumption of biomass carbon neutrality. That decision now haunts the whole field and seems likely to do so for some years to come.